The Gila is a species of woodpecker birds found in the Sonoran Desert. It is a medium sized bird of the desert regions living in the southwestern part of United States. There are a few common names of this magnificent bird. Color: The head, throat, breast and belly are brown colored with a small red cap on top of its head. Their backs and wings are black and white. It has a white rump. Females and juveniles do not possess red cap. The eyes are dark red in color. Size: These birds are 8 to 10 inches long. Bill: They have black colored, pointed bills. Tail: White upper tail is covered with striped central tail feathers. The wings in the lower portions are white. Legs: The legs are short with strong toes and sharp claws. Tongue: The tongue of this woodpecker is long, pointed and sticky. Weight: An adult woodpecker weighs around 68 gm. Wingspan: Their wingspan stretches up to 16 inches. These birds are found in southeastern part of California, southwestern Nevada, southern Arizona, southwestern New Mexico and southern part of central Mexico. During winters these spectacular birds migrate to southern parts of USA. 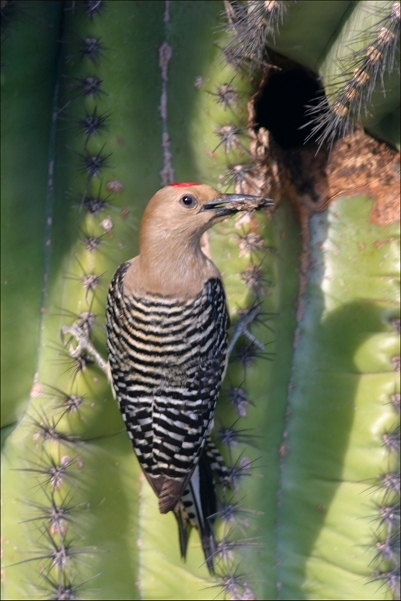 Gila woodpeckers live in cities, wooded desert washes and in saguaro cactus. They permanently inhabit the Sonoran Desert. Let us read the behavioral patterns of this bird species. These birds tend to bang loudly on metal chimneys and pipes to announce their territories and also to attract mates. The Gila woodpecker builds its home wherever it is possible. Though it prefers to build houses in saguaro cacti. This species of Woodpecker is noisy and blazing. They are found foraging in the canopy of trees. They search for irregularities in the bark and are curious to get inside the holes of dead wood. The males are very aggressive when it comes to protecting their nests. Adult birds undergo a complete post-nuptial molt in the months of August, September and October. These medium sized woodpeckers are cavity nesters. They dwell in the same nest for more than one season, if it remains vacant and not captured by other animals or birds. 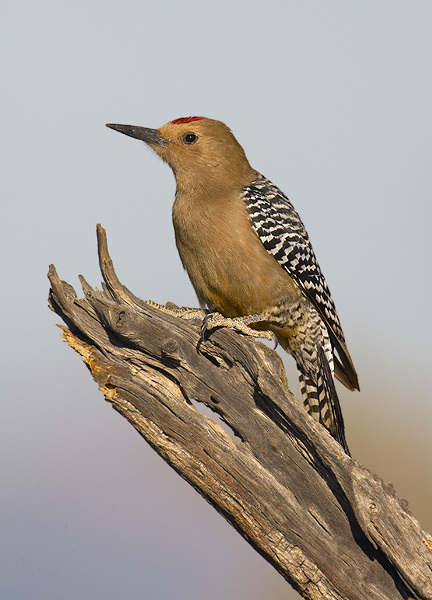 The Gila Woodpecker is monogamous by nature. It prefers solitude to company during the reproduction phase. This woodpecker calls in a rolling “churr” sound. It makes a “yip yip yip” and also a “kee-u kee-u” sound. These beautiful woodpeckers have a long and steady drum. Their calls may resemble a to that of a Rubber ducky. 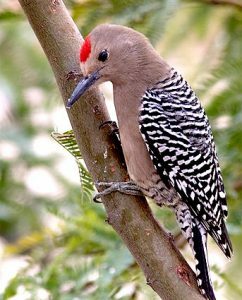 The Gila Woodpecker feeds on beetles, grasshoppers, ants, fruits from saguaro cactus, berries and mistletoe. They are known to hang on the garden humming-bird feeders and hastily lick the sugary water. 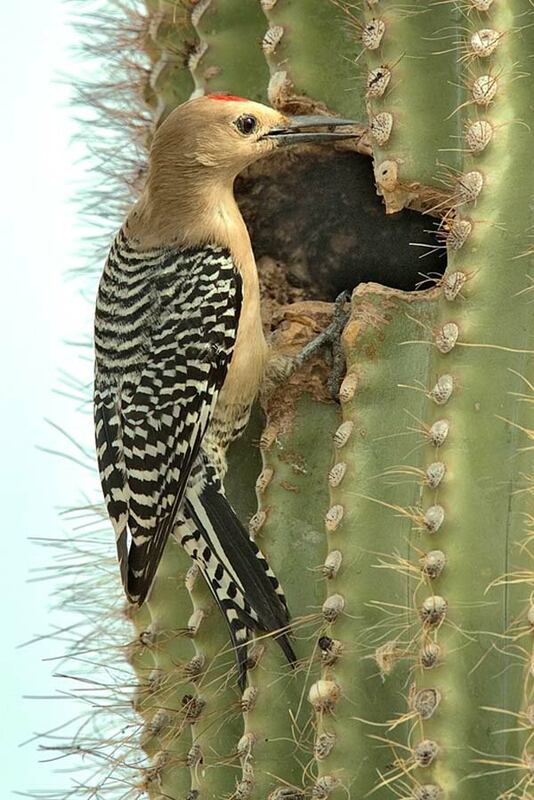 While the males search the trunk and main branches of the cacti for insects, the females hunt for the diseased parts or the ends of the branches. This red capped woodpecker is noisy and has a loud, screeching call during flight. They are moderately high flyers. Woodpeckers’ have 2 toes on each foot which are pointing forwards and 2 which are pointing backwards. The toes help them stick to trees and branches in a vertical posture. They use their inflexible tail feathers to stabilize and hold themselves straight and erect. The predators of the Gila Woodpecker include bobcats, coyotes, hawks, housecats, snakes, fox, kites, falcons, mountain lions and wolves. Gila Woodpecker mates from April through August. It raises about 2-3 broods in a single season. The eggs have a twelve to fourteen days incubation period. The nest is just a hole in a giant saguaro cactus or any tree. Woodpeckers generally lay three to four eggs. If food is abundant then Gila may have a second clutch in the month of July. After digging the nest hole, the mating pair allows the cactus to dry up for quite a few months before it is utilized again. This makes the cactus to build a solid dry wall around the nest. The eggs are white in color and not very sleek when fresh. After sometime it becomes fairly shiny. The shape varies from ovate to elliptical-ovate and is at times quite pointed. The Gila digs into a cactus or uses a mesquite bush for building nest. 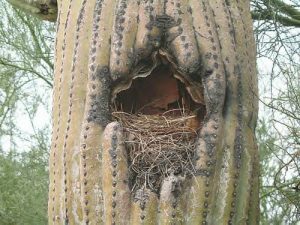 The saguaro is the most sought-after nesting site because the cactus offers security with its spines and the 30 degree lesser temperature inside. Both the parents share the 2 week incubation phase and feed the young one for a month after they are hatched. The young ones are bare and blind at first but become completely clothed in the feathers before leaving the nest. The male protects the nest as it is prone to attacks by foxes, flickers, cowbirds and other animals. The young woodpecker leaves the nest when they turn one month old. The young one feeds on insects, fruits and scavenged items from human territory. In captivity these woodpeckers can live up to ten years. They however live up to seven years in the wild. 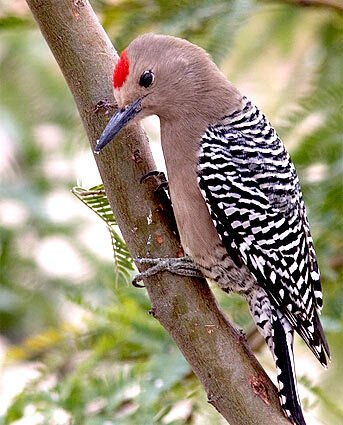 Gila Woodpecker is classified as “Least Concern” by the IUCN. Find out some interesting facts about these amazing birds. These Woodpeckers are closely linked to the colorful toucans and jacamars which live in tropical rainforests. In the desert, the woodpeckers carry out an important ecological function of taking out detrimental flesh from the saguaro cactus plants. Here are some pictures of this fabulous woodpecker.